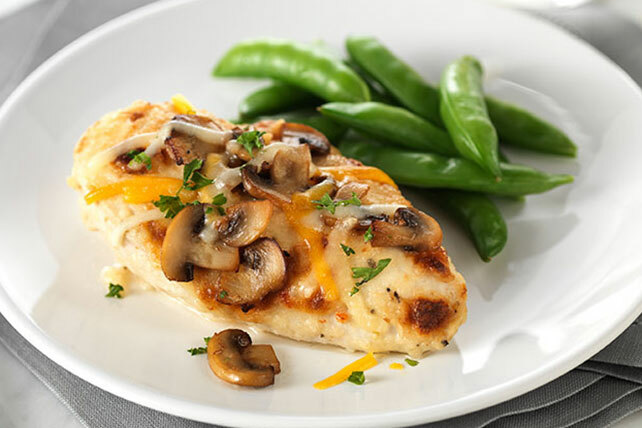 Add great, bold flavor to zesty chicken with mushrooms and basil. The melted cheese on top of our Marinated Zesty Chicken doesn't hurt either! Pour dressing over chicken in shallow glass dish; turn to evenly coat chicken. Refrigerate 1 hour to marinate. Remove chicken from marinade; discard marinade. Place grated topping in shallow dish. Add chicken; turn to evenly coat both sides of each breast. Place in single layer in shallow pan sprayed with cooking spray. Bake 30 min. Meanwhile, cook mushrooms in skillet sprayed with cooking spray on high heat 3 min. or until tender, stirring frequently. Stir in basil. Top chicken with mushrooms and shredded cheese; bake 5 min. or until cheese is melted. Prepare using KRAFT Light Zesty Italian Dressing. Substitute fresh cilantro or parsley for the basil.